Liver surgery, especially for cirrhotic patients, is one of the last areas of resistance to progress in laparoscopic surgery. This study compares the postoperative results and the 2-year patient outcomes between laparoscopic and open resection for hepatocellular carcinoma in patients with histologically proven cirrhosis. From May 2000 to October 2004, 23 consecutive cirrhotic patients who underwent laparoscopic hepatectomy (LH) for HCC were compared in a retrospective analysis with a historic group of 23 patients who underwent open hepatectomy (OH). The two groups were well matched for age, gender, American Society of Anesthesiology (ASA) class, tumor location and size, type of liver resection, and severity of cirrhosis. The selection criteria for both groups specified a small (size < 5 cm), exophytic, or subcapsular tumor located in the left or peripheral right segments of the liver (II–VI segments, Couinaud); a well-compensated cirrhosis (Child-Pugh A); and an ASA score lower than 3. In the LH group, 15 subsegmentectomies, 3 segmentectomies, and 5 left lateral sectionectomies were performed, as compared with 12 subsegmentectomies, 5 segmentectomies, and 6 left lateral sectionectomies in the OH group. 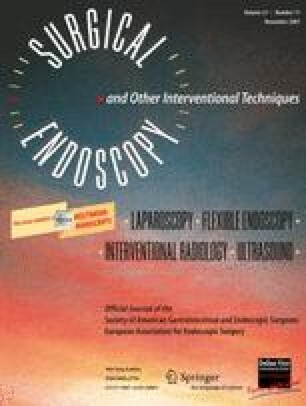 One patient in the LH group (4.3%) underwent conversion to laparotomy for inadequate exposition. The mean operative time was statistically longer for the LH group (LH, 148 min; OH, 125 min; p = 0.016), whereas blood transfusions (LH, 0%; OH, 17.3%; p = 0.036), Pringle maneuver (LH, 0%; OH, 21.73%; p = 0.017), mean hospital stay (LH, 8.3 days; OH, 12 days; p = 0.047), and postoperative complications (LH, 13%; OH, 47.8%; p = 0.010) were significantly greater in OH group. There was no statistically significant difference in mortality and 2-year survival rates between the two groups. This study shows that LH for HCC in properly selected cirrhotic patients results in fewer early postoperative complications and a shorter hospital stay than the traditional OH. The 2-year survival rate was the same for LH and OH.